The enlargement viewer only works properly once ALL images on this page are loaded. ID: Orange-gold color body color with small silver marking. Comments: I don't note this colorful little perch often, but when I do it is around kelp or reef structure in small schools of three or four. 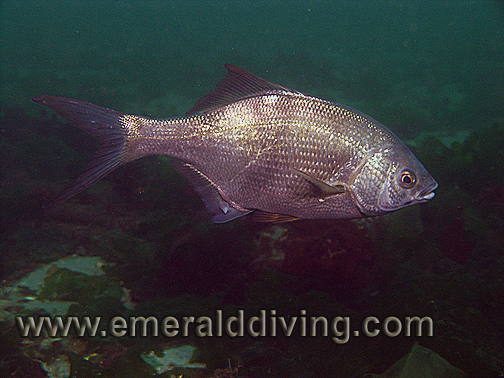 My best luck in finding kelp perch is on night dives at Three Tree Point when this perch often sleeps near the broadleaf kelp or reef structure. ID: �Tarnished� silver body with darker, vertical bands. 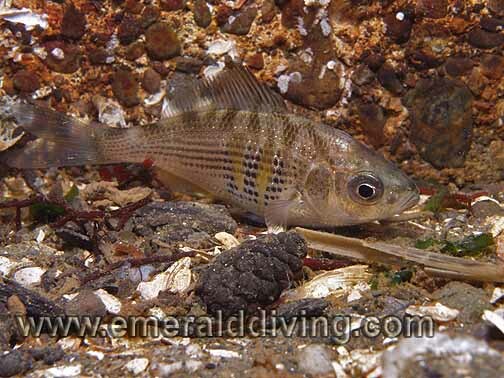 Comments: Pile Perch are common dive companions throughout Washington waters anywhere there is kelp and/or reef structure. These perch are the largest in our waters and often patrol in schools - sometimes very large schools. 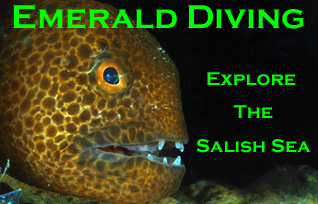 Edmonds Underwater Park offers a good opportunity to encounter schooling pile perch. Pile perch give birth to live young. ID: Brilliant silver body with small yellow bars on side. 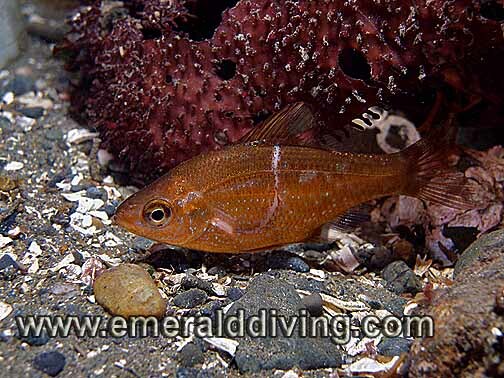 Comments: Shiner perch are another common campanion when diving Washington waters, espcially in Puget Sound. 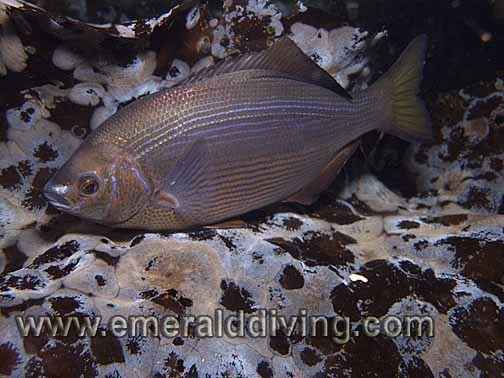 On a few occasions I have witnessed massive schools of thousands of shiner perch schooling at Sunrise Beach and Blakely Rock. I often find shiners at night sleeping close to the bottom. Distinctive markings: Brilliant blue and orange horizontal stripes. Comments: With its brilliant blue and orange striping, the striped seaperch almost looks like something you expect to see when diving the tropics. Like the pile perch, striped seaperch are common throughout all Washington waters anywhere structure and kelp are prevalent. This perch often travels in midsized to large schools. Stripe seaperch give birth to live young.